Many industries such as agricultural, construction, aerospace, automotive and electrical require different lengths and shapes of tubing for specific applications. Pipe Bending Components – Woolf Aircraft Products, Inc. In the process of pipe bending, or tube bending, a length of pipe is placed between two dies and clamped down. Press bending is a common method used in tube fabricating processes. A die in the shape of the desired bend is forced against the pipe resulting in the angle being formed in the tube. Other machines use mandrels during the pipe forming process, or pack the length of pipe with sand. This type of pipe bending is usually a hot forming process and creates a more uniform curve in the pipe; the use of mandrels or sand prevents the potential collapse of the interior of the pipe and minimizes shape deformation. Another method uses a similar process to tube rolling in which pipe is fed through a series of rollers to curve a section of pipe. Custom tubing shapes are available for pipe bending, but it is often more cost-effective to choose the bend radius from a selection of standard options. A length of tube can be bent a single time, or multiple times if needed. Common bends are any angles between 1° and 90° and these bends are used in items such as canopies, trusses, bridges, sculptures and exercise equipment. 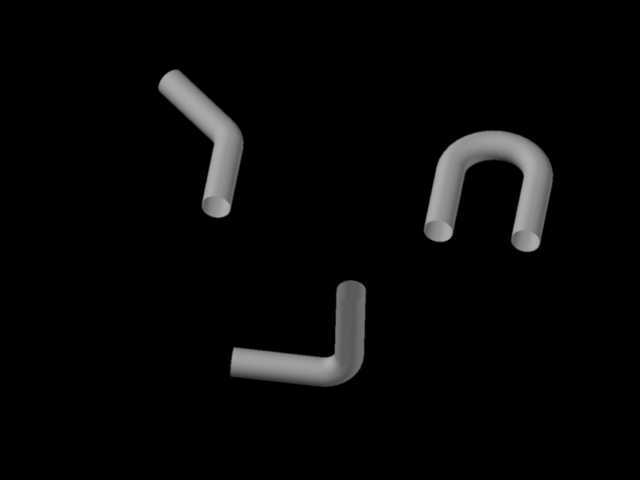 Other more complex bends can be 180° or have 2D and 3D bends to form part of a flow system. The bending process, whether it is hot or cold, alters the properties of the pipe, and therefore different factors needs to be taken into consideration as part of the manufacturing decisions. A side-effect to the process of pipe bending is the deformation that occurs in the wall thickness of the pipe around the bend. The inner curve of the bend becomes thicker, while the outer curve wall is stretched and thinned, making it weaker and more susceptible to damage. Internal support can be used to reinforce the wall of the pipe and provide a more uniform inner radius for consistent flow. Wrinkling may also occur on both the exterior and interior wall of the pipe as the wall compresses, slightly affecting the capacity of the pipe. Distortion is seen more clearly on thin walled pipes as they provide less resistance to structural change. However, the wider a pipe is, the smaller the ratio of distortion will be to its capacity and processes such as mandrel bending prevent this. Pipe Bending Pipe bending is the process of using manual or automated machine methods to adjust the angles of straight tubing or piping. Using hot or cold working processes, pipe bending is a widely available service from metal manufacturers.